After breakfast proceed to Simlipal. Declared as a national park in 1973, Similipal National Park is best known to conserve the endangered tiger species in Orissa. 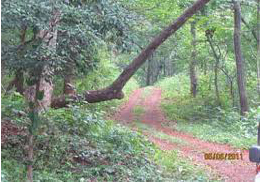 It is a great place to explore during your Wildlife Tour of Orissa. After breakfast proceed to Bhadrak and then Chandbali (another 60 kilometers drive) Chandbali - Dangmal Island (by boat)After arriving at Chandbali, go for a motorboat cruise to reach Dangamal Island and then check in a lodge. On your way, watch beautiful birds and the mesmerizing countryside.This deltaic region of Orissa has a couple of small islands. Some of them are Dangamal, Ekakula, Habalikati etc. The amazing thing to visit here is to witness the Olive Ridley Sea Turtles arriving in shores to lay eggs in numbers (thousands) twice every year between January and March. An unexpected additional attraction is the remains of two 9th century monuments, a temple dedicated to the worship of Lord Shiva and a Shakti Shrine at Dangmal. After breakfast proceed to Bhitarkanika; check in at forest lodge and have refreshment. Later go for a boat ride inside the wildlife sanctuary. Also visit the Olive Ridley Turtle nesting site located on the beach stretch of Bhitarkanika. Bhitarkanika is a natural habitat of a lot of wild creatures like Crocodiles, King Cobra, Pythons, Wild Pigs, Monkey, Sambars, and Spoted Deer etc. There is a Crocodile Breeding Farm at Dangmal. The pride possession of this Farm is the White Crocodile Sankhua, a rare species in the World. Over 170 species of resident and migratory birds of different hue enhance the beauty of the wild.Bhitarkanika the second largest compact mangrove ecosystem in India is a wonder in the wild. It is acclaimed for its biodiversity in flora and fauna, it is. It is also a Sanctuary and National Park, extending over more than 600 square kilometers. Bounded by rivers on the three sides and the sea on the fourth, Bhitarkanika is a fully forest are full of numerous creeks and canals which finally meet the sea and make the estuarine delta, the playground of the Bay of Bengal. 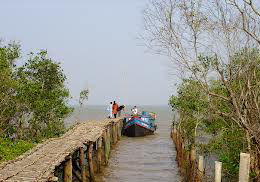 Bhitarkanika is famous for its evergreen mangrove forests. This forest houses some of the endangered species of flora and fauna. Among them are the famous "Pneumatophores", or the "Trees with breathing roots ".